The vulnerability was patched via an update issued by ES File Explorer, yet Avast data shows more than 60,000 users still running a vulnerable version of the app. 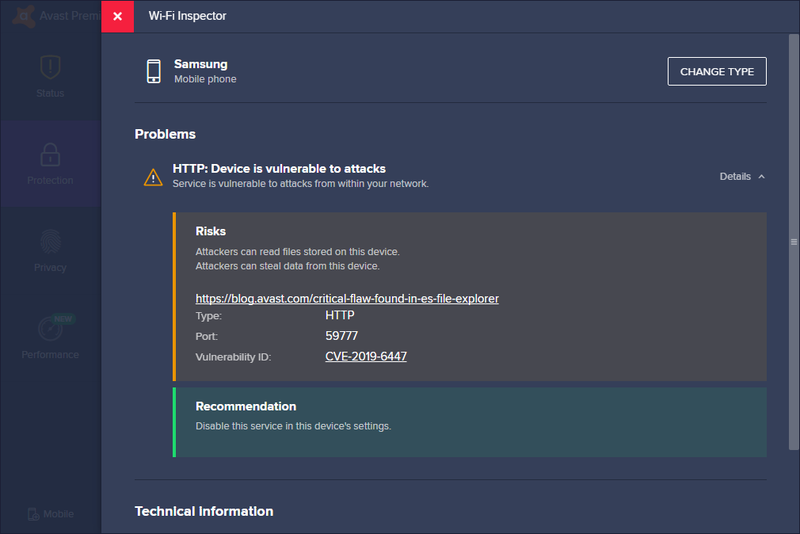 Avast PC Antivirus users can scan their network using Avast Wi-Fi Inspector to help them discover devices running a vulnerable version of ES File Explorer on a mobile device connected to their home network. In addition to the commands, the web server also allows the attackers to download any file they know the path to. Some of the commands conveniently enable the retrieval of the paths to interesting files such as personal photos, videos, music, and voice recordings. A CVE number, CVE-2019-6447, has been assigned to this vulnerability. 1- Immediately update your ES File Explorer app to the latest version in the Google Play Store to avoid unwanted data leaks, which may occur on public Wi-Fi networks, private networks, and business networks. 3 - Always update all of your apps to the latest version to protect you, your family, and your businesses from security threats.